In 2007, per registered vehicle, the fatality rate for motorcyclists was 6 times the fatality rate for passenger car occupants! In Oklahoma alone, in 2008, 74% of those killed in motorcycle accidents were not wearing helmets. It is critical that motorcyclists understand the severity of head injuries they can sustain in a motorcycle crash and how to best protect themselves from injury. McIntyre Law, P.C. 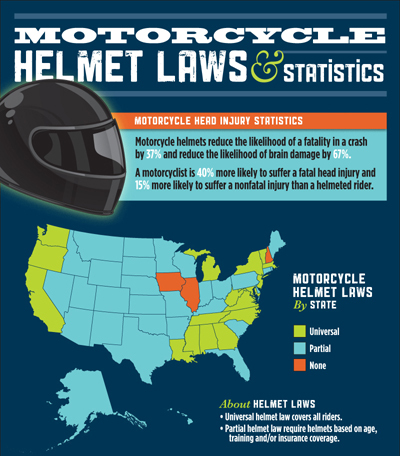 have compiled the following infographic to help motorcyclists understand state motorcycle helmet laws, fatality statistics for helmeted and non-helmeted motorcyclists, as well as, the correlation between helmet laws and motorcycle fatalities. With this information, motorcyclists can make better decisions to help keep our roads safe. If you or a loved one has been injured in an Oklahoma motorcycle accident, contact the attorneys at McIntyre Law, P.C. to learn more about your rights and how we can help you recover from motorcycle injuries. Call 1-877-917-5250 now for a free consultation. To learn more about how you can help keep Oklahoma roads safe for motorcyclists and drivers, read these motorcycle safety tips from the Motorcycle Safety Foundation. The Effect of the 1997 Texas Motorcycle Helmet Law on Motorcycle Crash Fatalities, 2010. Bavon, Al and Christina Standerfer.